Blue backlit Dual Track LCD display – two LCD windows display the status up to 13 workout details. Bluetooth LE connectivity and Charging USB port. 20-Inch stride length, 29 programs, 25 levels of resistance, 4 user profiles and more. Grip heart rate or telemetry enabled for chest strap. This machine has all the perks and benefits of any elliptical trainer, in that it allows you to get a solid workout in your own living room and without placing any stress on your joints. While running great distances can induce a lot of impact on your knees, shins and other joints; using an elliptical machine allows you to glide against resistance smoothly. But not all elliptical trainers are made equally. Depending on the machine you buy you can expect a very different experience and it’s very important to ensure that you do your research, shop around and ultimately pick an investment that will provide you with a quality elliptical workout. In this complete elliptical machine buyers’ guide, you’ll discover what to look for when choosing a machine as well as what it is that makes this particular unit so effective at what it does. Let’s start by looking at this machine that has it all. The Nautilus E616 is a fully featured machine from one of the best known brands in the fitness industry; and it offers better value for money and a better workout than all the competition. Nautilus has been around for a long time. If you head down to your local gym and take a look at the machines there, you’re very likely to find that a lot of them come from this brand. In fact, you can probably try out their elliptical machines right there and then! This is an important factor when considering your purchase: you want a well-crafted machine that is going to stand up to lots of wear and tear over the years and not start to come apart. If you are still worried, then you’ll rest easy knowing that this comes with a 10-year warranty for the frame, 2 years for parts and 1 year for the electronics meaning you’re fully covered. Nautilus are known for their great build quality and customer support, so you can be confident when spending a lot of money. One downside is that reviews find that this can be a somewhat fiddly machine to put together, with average construction time taking around 2 hours and the instructions not being terribly helpful. This is not a big problem though, seeing as you can easily find a lot of information and advice to help you get started online. This is a small price to pay for a top-of-the-range machine. And this machine also shows examples of smart design out of the box and is perfectly tailored for home workouts. At just 70L x 28W x 71H, this is a surprisingly small elliptical trainer for everything it can do. That means it will sit quietly in the corner of your room without being an eyesore or getting in the way. It also comes with wheels attached that make it all the easier to move it around if you need to. And it looks pretty cool too so you won’t mind looking at it when you’re not training. If anything, it’s a constant reminder to work out. But more to the point, this is a machine that comes packed with features that can take your training to the next level. That is why it’s our top pick by far. Let’s start with the basics. This is an elliptical machine that operates on a weighted flywheel. That means that you are essentially training against resistance in order to rotate a cable inside the body of the unit. This provides the resistance you need and allows you to adjust it accordingly. The flywheel has a smooth and quiet operation which allows you to work hard without it sounding like you’re going to bring the house down. What’s more, this means that you’re testing yourself without fighting the machine. This is a minimum requirement when choosing an elliptical machine. Some others on the market use magnetic resistance rather than the flywheel and while this works on paper, it can’t offer the same level of resistance and therefore can’t provide the same level of strength training or cardiovascular exercise. Magnetic resistance alone won’t be enough for most people to meet their training goals and especially as they improve. The 20’’ stride length meanwhile should be comfortable for almost any users and the machine is suitable for loads up to 300lbs. 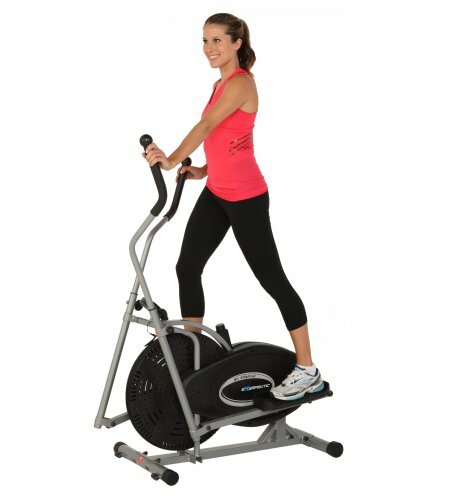 On top of the excellent flywheel, the Nautilus E616 Elliptical also comes packed with different programs and workouts. You can change the incline, the amount of resistance (there are 25 settings) and more or let one of the 29 pre-set workout programs handle that for you (thanks to the motorized incline). This is an excellent way to keep challenging yourself, keep pushing yourself and keep taking your training to the next level. And it’s something that a lot of machines on the market just can’t compete with. When buying an elliptical trainer, it’s crucial to think about the long term. Will the machine be able to grow as you go? Will it be able to keep offering new challenges? The best elliptical trainers will be suitable for everyone from complete beginners to advanced athletes and this makes a much better long-term investment. Later in this text, we’ll discuss just why it’s so important to have resistance during your cardiovascular training. For now though, rest assured that this is a machine that can more than meet all your fitness requirements. On top of the 6 incline settings, the 22 workouts and the effective flywheel, the E616 also brings your workouts into the digital age with a lot of modern fitness tracking features. This machine comes with a built-in heart rate (another minimum requirement you should look for) meaning that you can closely monitor how much exercise you’re getting and how hard you’re exerting yourself. This lets you use more advanced forms of training – either trying to stay inside your fat burning zone or using HIIT (high intensity interval training) depending on which is your preferred approach. And of course the customizable workouts will take your heart rate into account too. The heart rate monitor is also telemetry enabled. This means that you can forego the grip method of measuring your heart rate and choose to use a chest-strap if you’re serious about getting the very best and most detailed information. This plays nice with companies like Polar, which will be good news for any serious athletes or anyone with heart problems. Better yet, the Nautilus E616 also allows you to export that data. You can sync all of your training data (time exercising, heart rate, calories burned) with Nautilus Connect or with MyFitnessPal. MyFitnessPal is an industry leader when it comes to fitness tracking and it’s a fantastic advantage being able to track the calories you consume during the day and then measure this against the calories you burn during workouts and from daily life. This in turn means you can know exactly how many calories you need to burn and then continue to exercise until you get to that point. This is one of the only ‘sure fire’ ways you can burn calories and lose weight and it’s something we’ll be looking at in more detail later on in this guide. You can actually see a ton of data and information as you train too, thanks to the ‘DualTrack’ display that features two LCD monitors with your time, distance, calories, heart rate and more. With all this information right there on the screen, it’s hard not to feel motivated as you start beating personal bests. Of course you can also enter things like weight and goals in order to get more tailored advice and better workout programming and the machine allows you to create multiple user profiles so more than one person in your home can benefit. But if you’re not interested in reading the data points, you’ll have the option to watch all kinds of other things. For example, there’s a handy stand that is specifically designed for a Kindle or an iPad. Making this even easier is the handy built-in USB charger which is also how you sync data with the app unless you’d rather use the wireless Bluetooth method. And a nice added touch are the acoustic chambered speakers that face right at you while you’re working out. If you’re someone who likes to blast a little Survivor while they work, then this will keep you motivated. There’s even a fan to help keep you cool while you train. And actually, you mustn’t underestimate just how useful this is: with the fan in place you can avoid sweating which means you can get a workout in just before you head to work and not worry about dripping in sweat. It also means you’ll be much more inclined to work out when it’s hot and you’d really rather not! As you would expect from a machine with this many features and such an established brand behind it, the Nautilus E616 is one of the best rated elliptical trainers on the market and has fantastic customer reviews. “Executive summary: The Nautilus E616 Elliptical Trainer is an excellent workout machine. The E616 is sturdily built and the core stride mechanism is very good for people with normal stride lengths. Be aware that if you are taller than 6 feet, you may find the stride to be a bit on the short side. “Works great! Reasonable priced compared to ellipticals with similar features. Many different programs. You can select if you want the target to be reached as time units (e.g 20 minutes) or calories. No problem syncing my workouts via Bluetooth with my Samsung S6 Edge. The benefits of the Nautilus E616 really become apparent as soon as you start comparing it to its closest competition. And in fact I urge you to consider buying this machine quickly if you’re interested in elliptical training. Why? Because right now the E616 is Nautilus’ top of the range product. The next tier down is the Nautilus E614 and at this moment the E616 is cheaper! Dual Track LCD display – two LCD windows display the status up to 13 workout details. Charging USB port and data export to Nautilusconnet.com or myfitnesspal.com. 20-Inch stride length, 22 programs, 20 levels of resistance, 2 user profiles and more. None of this is to say that there are no other good elliptical trainers on the market. The Schwinn 430 or Nautilus E614 are great products, they just don’t quite compete with the Nautilus E616 which is one of the best rated and perhaps 2016’s best option. Likewise, some other models though might be more appealing if you’re looking for something very specific or perhaps something a little bit different. For example, the Stamina In-Motion Elliptical Trainer is really not a comparable device and has an entirely different use case scenario. Rather than being a full elliptical machine with handles and a heart rate monitor, this is instead a much more compact set of pedals that you can use ‘hands free’. 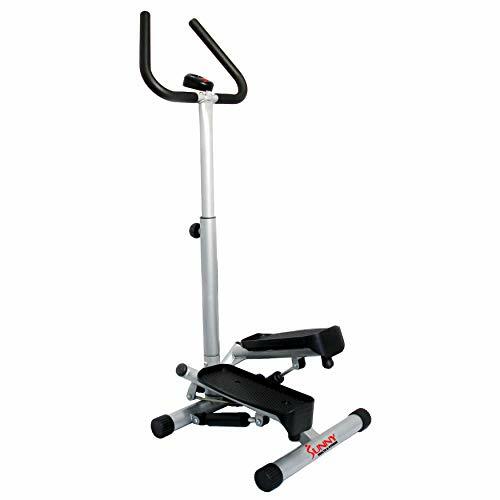 Compact, lightweight elliptical trainer for the home or office. Foot-pedal-only chassis fits handily under a desk or in a closet. Low-impact design protects back, knees, hips, and ankles. Sturdy steel construction; non-slip pedals; Assembly required. This makes it ideal if you’re a student or perhaps a young professional living in a studio apartment without much space. It also makes it ideal for multitasking: you could use this while washing dishes for example or even while sitting down watching TV! You could slip it under a desk while working as well. Will this provide you with the same health benefits as the full E614? Not at all. But if you’re looking for something cheap and convenient then this is the best option for you. 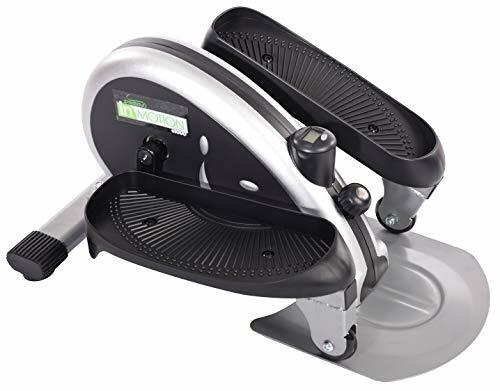 Either that, or the Sunny Health and Fitness Twister Stepper which adds the ability to train your arms as well, thanks to some attachable handles. 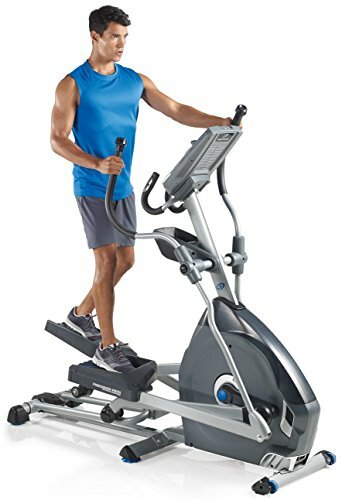 Twist stepper workout machine with handlebar and multi-function LCD computer. Twist action works and tones buttock and leg muscles with reduced bone/joint pressure. Computer functions include: time, calories, scan, and count. Adjustable stepping height; handle bar for balance. Heavy duty steel construction, Part #12 is pre-assembled. Likewise, the Exerpeutic Aero Air Ellipticals is a somewhat different product that caters to a different audience. This is an example of a product that uses magnetic resistance to provide a gentle workout and to keep the price and the size small. 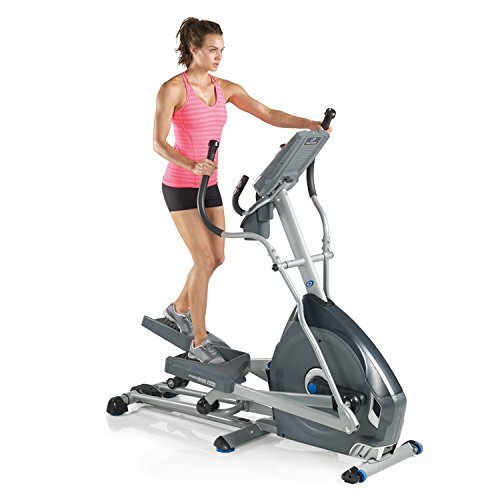 Compact elliptical trainer with adjustable strap tension and workout computer. LCD display indicates distance, calories burned, elapsed time, and speed; one year warranty. However, as mentioned earlier these types of elliptical machines are also just not up to the same standard in terms of fitness benefit as the ones that uses weighted wheels. This is fine if you’re someone with a bad knee who needs to move it slightly more in order to improve mobility but it’s not going to be up to the challenge if you want to actually get into shape, burn calories and build muscle. And that said, you might be better off with a recumbent bike if you’re really struggling with knee pain. This means you’ll be sitting back with your legs out in front and that way you’ll be taking the weight off of your most painful joints. Or perhaps you’re looking for something entirely different. 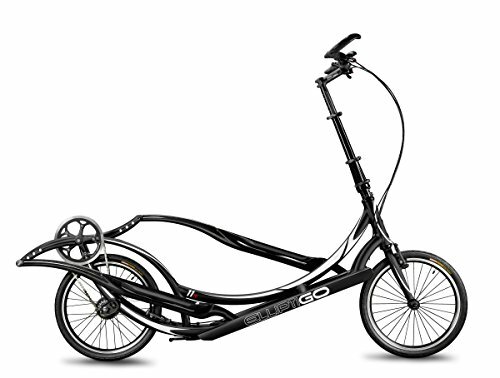 In that case, the ElliptiGO 11R is certainly… interesting. Describing itself as the world’s first ‘outdoor elliptical bike’, this does just what that would suggest – allowing you to use an elliptical motion to power the bike around the outdoors. Interestingly, it can also be used indoors as a stationary exercise machine. Comfortable: Natural “stand up” riding position reduces stress on your neck, back and eliminates seat pain. Top of the line model is the world’s most advanced and capable elliptical bicycle. Designed for serious enthusiasts who demand performance. Great workout: Burns 33% more calories than a bike; Gives a better workout in less time. The catch? Apart from the fact that this is a big device to store, it also costs a rather large sum of $3,499. When you take all this into account, it’s not going to be for most people. But it is interesting! The Operation: The resistance can be pneumatic, it can be a weighted flywheel or it can be magnetic (among other things). By far the very best performance comes from a weighted flywheel which will provide you with enough resistance to build some real muscle and burn some real fat. However, it’s also important to read about the quality of the operation. Is this a smooth ride? A quiet one? Settings: The more settings you have, the more versatile your machine will be. Don’t make the mistake of buying the cheapest and easiest elliptical machine because you’re someone who doesn’t need a big challenge. While this might sound smart on paper – remember that your fitness will improve and you need a machine that will grow with you. Likewise, some specific types of workout (like HIIT) actually require you to be able to switch quickly between light and heavy resistance. Storage: Think about whether you have space for this machine, where you’ll keep it and how heavy it is. Likewise, look for wheels that can help you to more easily move the device around. Features: The features you need will depend greatly on the type of workout you’re looking for and how you intend on using your machine. Again though, more features means more versatility so it’s definitely better to have ‘too much’ than not enough. Likewise, you should think about the features that the device comes with: do you need to support a chest strap? Do you need a fitness tracking? Again think not only about what you need now but also what you might need in the future! Price/Investment: Weigh up all of these different features and factors against the price. Does this offer good value for money? At the same time, is the machine likely to stand the test of time or are you going to need to replace it somewhere down the line with another model? Think about the brand, the warranty and the customer support. But why get an elliptical machine at all? If you are looking for a great way to get into shape and a great way to do something new in your training at home, then you should look at using elliptical machines. Elliptical machines are of called ‘ski machines’ or ‘cross trainers’ and basically they involve placing your feet onto pads that move forward and backward or round in a circle while at the same time pulling and pushing handles as though you were skiing. Both the pads and the handles provide resistance and this makes it ideal for a workout of varying intensities. You Can Do it At Home: First of all, elliptical machines are something that you can train at home with. This is ideal for if you are the kind of person who starts out with good intentions but often finds themselves not making it to the gym. If you have elliptical machines waiting for you at home, then suddenly the amount of effort involved in training is far, far less. You don’t have to get in the car and drive to the gym and you don’t have to face going outside into the elements. You can simply crawl over from your bed to your elliptical machines and do a quick workout and this ease of use means that you will never have an excuse not to use them. You Can Multitask: Because you’re stationary during cross training, this means that you can use your elliptical machine while doing other things. The Nautilus E616 has a handy stand for iPads and Kindles but you can also position your trainer in front of the TV. This is ideal for passing the time and makes it much easier to stomach the idea of elliptical training if you normally struggle to stay motivated. They’re Versatile: If you can only fit one piece of CV equipment in your home, then make it elliptical machines. There are many reasons for this as we are listing here, but one of the simple ones is just that they are so versatile. Because elliptical trainers have handles as well as foot pads, this means you train the entire body with them, as well as training your overall fitness. You can use this then to train your lats and your shoulders and your legs which you can’t say as much for running. If you read elliptical machine reviews, then you will also find out just how many settings you can get and how these can affect the training you do. You can use them to build muscle, to tone, or just to improve mobility – and the best machines will be able to adapt as your body and your requirements change. They’re Low Impact: Elliptical trainers are fantastic for anyone who has knee problems – or for anyone who wants to avoid getting knee problems. The reason for this is that they will be running on the spot minus the impact that they would otherwise get on their knees and joints when their foot hit the concrete or the treadmill. If you are overweight, if you have any kind of joint issues, or if you are concerned about developing them in future then this is one of the safest ways to train along with swimming and using recumbent bikes. They’re Very Effective: The best elliptical workouts are full body workouts. This makes them not only a great way to tone your body but also a fantastic way to burn more calories and improve fitness. When you combine resistance and cardio to get ‘resistance cardio’ you actually increase fat loss without damaging muscles. This is something that Layne Norton, coach, bodybuilder and researcher discusses in detail in this blog post. Activating more muscle fiber this way will also result in more fat burning and muscle building hormones being produced subsequently. To get the most from your elliptical trainers, consider how you will train with them as well as how you’ll fit them into your daily routine. One useful tip is to calculate your AMR (active metabolic rate) before you begin training. Think about the calories you burn in a given day and use this to work out how many you need to add on top with your elliptical training. Tracking your basic calories can also help here. Another tip is to consider monitoring your heart rate and using this as part of your routine. Maintaining a steady 70% is believed by some to be optimal for burning fat but new evidence suggests that interval training may be more effective in some ways (there’s a study on it here). Also, make sure to make your workouts more fun and interesting – whether that means pumping out some music or listening to a podcast. Make sure to invest in the very best elliptical machine that will allow you to precisely track calories burned, your heart rate and more. Look for guided workouts, adjustable resistance and a build quality that will be a great investment. And for our money, the best option that satisfies all those requirements right now is the Nautilus E616. What are you waiting for? The compact Stamina In motion elliptical is one of my favorite pieces of equipment. It’s a fairly inexpensive device for a small apartment. Its very easy to use either sitting or standing with a smooth gliding motion. There is a pressure knob for resistance and what I like about it is that I’ve had it for the last two years and its held up pretty well and did not require any repairs yet.